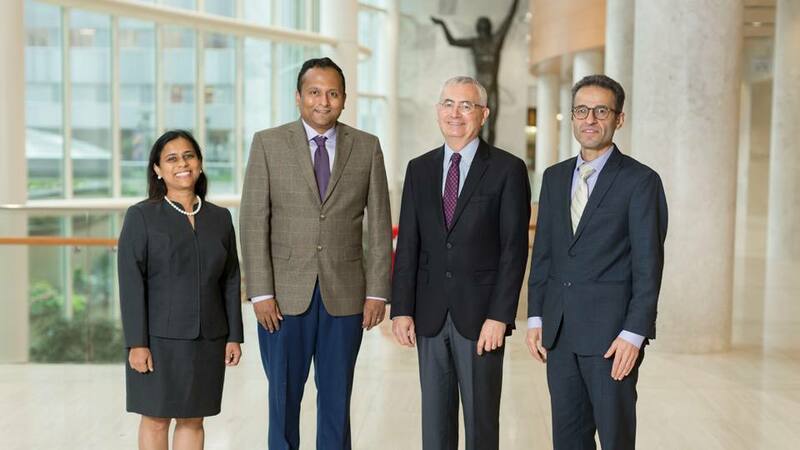 A team of Mayo Clinic pathologists have discovered a new tissue biomarker, DNAJB9, for fibrillary glomerulonephritis (FGN), a rare kidney disease of unknown pathogenesis and poor outlook—nearly half of all patients end up on dialysis within four years of diagnosis. DNAJB9 is the first glomerulonephritis biomarker discovered by laser microdissection/mass spectrometry, as well as the first biomarker for FGN. This pathogenic protein had remained elusive since the disease was first described in 1977. “The diagnosis of FGN has always relied on using histological, histochemical, and clinical features that overlap with other glomerular diseases,” says Surendra Dasari, Ph.D., a bioinformatician in Mayo’s Department of Health Sciences Research, who co-authored the study paper (published in Kidney International Reports). “The discovery of DNAJB9 opens doors for more specific diagnostics, which could lead to more targeted therapies. It also allows for the simplification of FGN diagnostic algorithms,” says Dr. Dasari. According to Mariam Priya Alexander, M.D., a renal pathologist in Mayo’s Department of Laboratory Medicine and Pathology (DLMP), who also co-authored the paper, the DNAJB9 breakthrough was a direct result of the team’s interest in evaluating a series of cases best described as Congophilic fibrillary glomerulonephritis. The resulting new DNAJB9 IHC test—which went live this past September—is highly sensitive (98%) and specific (99.7%) to FGN. Pictured from left to right: Mariam (Priya) Alexander, M.D. ; Surendra Dasari, Ph.D.; Paul Kurtin, M.D. ; and Samih Nasr, M.D. FGN forms nanometer-sized fibrils in glomeruli, which are the main filtration system in the kidney. Over time, these fibrils accumulate in the glomeruli and cause damage to kidney function as a blood filtration system. After a series of tests (including urinalysis, which detects the blood and protein) and serology testing, a nephrologist usually finds that the patient has renal insufficiency, or renal failure—when the kidney is no longer getting rid of waste in the body. 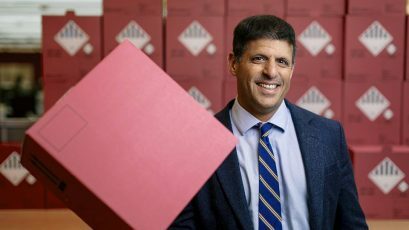 “This particular disease has no effective therapy, and most patients will progress to kidney failure and need dialysis,” says Dr. Nasr. Since renal insufficiency or failure are nonspecific symptoms, accurate diagnosis of FGN has, hitherto, required a rather complicated testing process, which demands a specialized, cumbersome technology. However, even with EM technology, FGN can be difficult to distinguish from other glomerular diseases that exhibit fibrils, including amyloidosis. 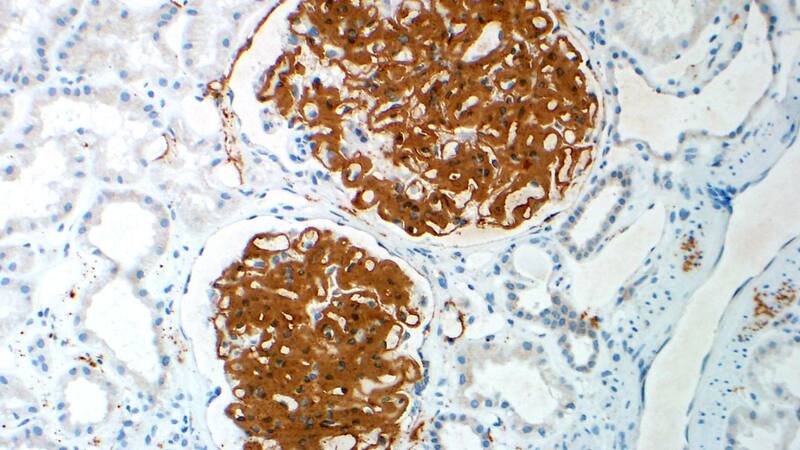 Compared to EM, the IHC test is much more user-friendly and inexpensive. It can even be performed by hand, if necessary. And since glomerular deposition of DNAJB9 is specific to FGN, the IHC test can effectively replace the EM requirement for diagnosing the disease. Jason Theis, Development Technologist in the Mayo Clinic Immunostains Laboratory, monitors testing in progress. Theis was instrumental to the development of the mass spectrometry method used in the laboratory. Thanks to their discovery of DNAJB9, the members of this Mayo team also developed a new mass spectrometry (MS) assay, which can distinguish FGN from amyloidosis and other glomerular diseases. This formed the basis for a new MS test for FGN. Because the method for detecting DNAJB9 by MS is virtually identical to that for typing amyloid in paraffin-embedded tissue, this test is particularly useful for cases where FGN is difficult to distinguish from amyloidosis. 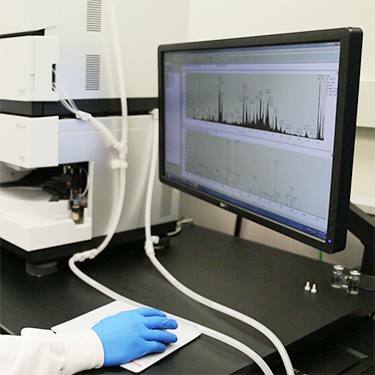 The entire diagnostic process can be accomplished in a single mass spectrometry assay. But then, using MS to characterize proteins in this way is routine at Mayo—for example, CTPL has analyzed more than 15,000 cases of amyloidosis involving many anatomic sites, including the kidney. The team’s work showed that the DNAJB9 IHC and MS tests are superior to existing methods for diagnosing FGN. Hence, incorporation of this biomarker into clinical practice will now allow more rapid and accurate diagnosis of this disease—especially in developing countries that don’t have electronic microscopy. This is profound when one considers that FGN has probably gone under-diagnosed—many patients have the disease, but they and their treating physicians don’t know it. Or, patients are misdiagnosed with some other renal disease. “FGN is, for sure, an under-diagnosed disease in developing countries, where electron microscopy is not routinely done in the practice of renal pathology,” says Dr. Nasr. Currently, most patients with this disease are nonspecifically treated with immunosuppressive therapy with very little success. This is because immunosuppressive therapies don’t target DNAJB9, but they instead target the immune reaction to DNAJB9 fibrils. Such therapy can also mean harsh side effects for patients. The discovery of DNAJB9 in FGN implies that, in the next few years, more targeted therapies might be developed that could directly eliminate or reduce the deposition of DNAJB9 in FGN glomeruli. This could lead to better outcomes for patients. Both the mass spectrometry and IHC tests for DNAJB9 are now available from Mayo Medical Laboratories as stand-alone tests for the diagnosis of FGN. 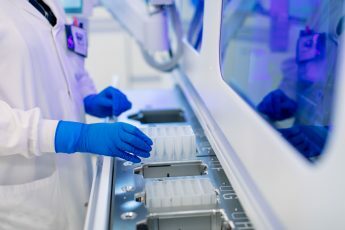 This breakthrough would not have been possible without the expertise of Mayo’s tissue mass spectrometry laboratory and immunohistochemistry laboratory team (that includes Drs. Dasari and Kurtin; Julie Vrana, Ph.D.; Karen Rech, M.D. 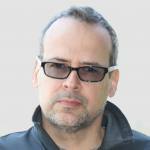 ; and Jason Theis), working closely with the renal pathology expertise of Drs. Nasr and Alexander. I was diagnosed with FGN in 2012, after several misdiagnoses. My disease progressed quickly to ESRD, by late 2013. I was on dialysis for a few months in early 2014, wth a Transplant (living donor) on May, 1, 2014. This is amazing news, and a glimmer of hope for early, accurate diagnosis. Praying for miracles and breakthroughs with good treatment options in the future.